3D can be used to create architectural walkthroughs. Architectural walkthroughs are made using 3D modelling software such as Autocad and their purpose is to provide architects and their clients with a realistic view of a building/structure from several view and angles before it is actually built in real life. Architectural walkthroughs can include the interior of buildings and can include furniture and interior decoration to give an insight into the potential of the building. It is common for the 3D model of the building/structure to include a 3D environment this will help to communicate how the building will look in the area it is going to be built as well as adding realism to the walkthrough. Sometimes animated 3D models of people and cars are used to show how the building will be used by people. 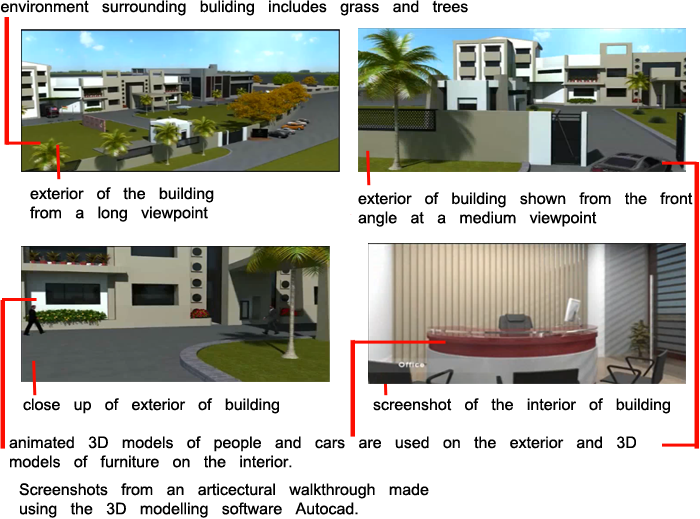 This example clearly illustrates how 3D is used in architectural walkthroughs to demonstrate how a building and its surrounding area would look from several angles and viewpoints and also how people would use the building. 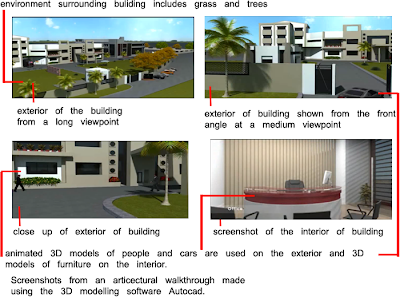 The example shows specific viewpoints of the 3D building model from the exterior and the interior. It also shows how 3D models such as landscape,trees,people and cars, have been used to add a sense of reality to the walkthrough.